Folks, I get hundreds of emails daily. This may surprise some of you, most will think “so? I do too!” But if most of them are promotional in nature and since I can’t take advantage of the offers, there is no need to continue receiving them. Kind of a “don’t show me what I can’t have” sort of deal, you know? So, I wanted to unsubscribe. I’m gonna describe that process so far to you – so if you don’t want to hear me whine for a bit, move along. SOME ARE EASY But some are insane. Local meat shop in Dothan, Butcher’s block for example….. there’s a link to click in their email. You click that link and it takes you to a page that requires you to decipher a million different options before you can find the one to unsubscribe. Even then, you have to enter your email address, even though you arrived there from an email sent TO YOU FROM THEM. Or this one, from Southern Garden Scents, a company I used to order fragrance from……. with a “click to unsubscribe” button at the veeeeerrrry bottom. Now, once you click that, guess what?? Southern Garden Scents and poMMo mailing management software assume that since I’ve only jumped through their hoops and confirmed three times so far that it’s still possible I might not know what I’m doing. This is insult to injury!! I wonder if the page owner realizes what horrible mailing list management software this is??? 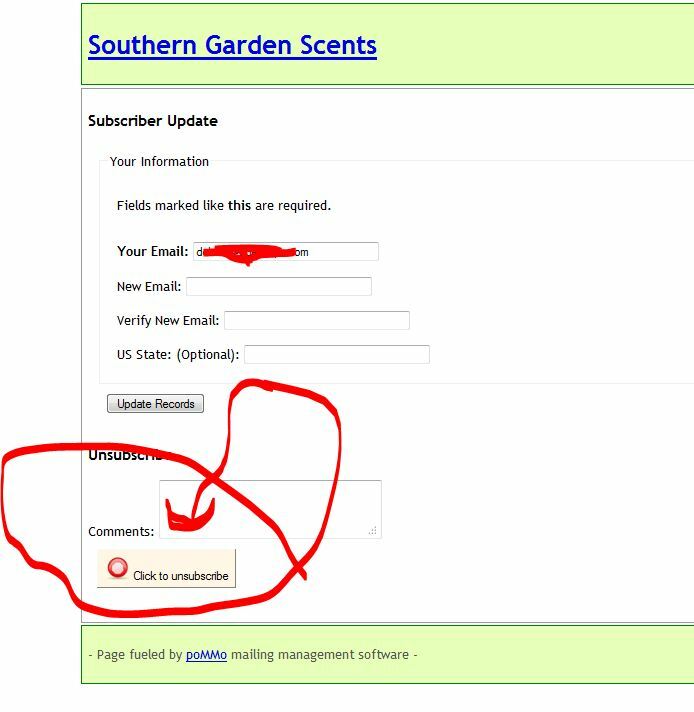 Icing on the cake is that after all this, I received yet ANOTHER email from Southern Garden Scents confirming that I’ve been unsubscribed. And poMMo mailing management software – you should be ashamed!! 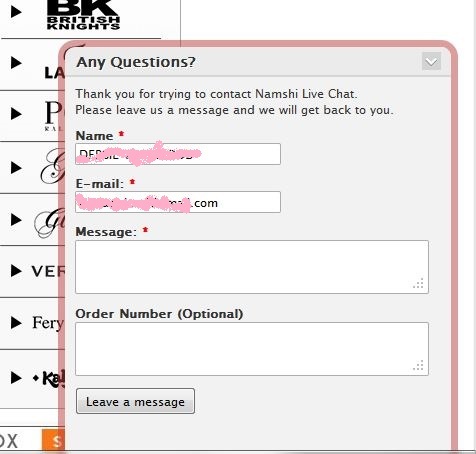 The total epitome of annoying unsubs, I believe, is my personal experience with a Middle Eastern Business named Namshi. They have a website that advertises free shipping to the entire region. I saw a blouse I loved, on sale. When I clicked to put it in my basket, the sale price disappeared. But I thought I was in luck, there was one of those handy little “Got Questions?” live chat tabs, so I clicked it and filled it out with my question, and sat back and awaited the answer as to why the price changed. don’t ever ever ever fill in this form on their website if you do not wish to begin innundation with marketing emails! And I waited and waited, and finally called to ask why, was told that someone would call me back and provide that help, must be a mistake so sorry, no can help. Never got a call. What I *did* start getting was a brazillion marketing emails from Namshi – like at least 3-4 a day. I hit the “unsubscribe” link, put my email in, and assumed it would stop. No such luck, the email kept coming. No way was I gonna buy from a company with sketchy business practices that doesn’t reply to their customers. I put in a complaint form in their “contact us” section, and was told to use the unsubscribe link in the emails. I explained I had, to no avail. They asked what email address I had subscribed with. Though we’d been emailing back and forth, I provided it. They replied that it wasn’t found in their subscription database. I explained I hadn’t subscribed to anything, but HAD tried to ask a question using their form – that must be where they added me to their lists. They replied they’d taken care of the matter and closed out the complaint form. Well allrighty then – I copied every single message – enclosed them in a reply, and asked what I should do next to stop their marketing messages, because surely they didn’t want to send out unsolicited, unwanted marketing emails. Amazingly, they sent me a message about “problem resolved”. And there it was. Done. Finally. After about three phone calls and 12 emails. And my personal favorite so far – Everyday Minerals…..amazing product, really. Excellent mineral makeup. But there is no “unsubscribe” link in their advertising email. You are directed to their website to “manage your account”. But this is the deal, you don’t *have* to have an account in order to check out, you can do so as a “guest”. But then you’re magically subscribed to the email newsletters. Sooooo, since I checked out as a guest, I have to FIRST create a customer account, THEN reply to the emails prompting me to confirm that I really *do* want to create this account, THEN log into this account, THEN unsubscribe from the newsletter. Holy cow. At this point, I decided that SURELY the companies involved had no idea how frustrating or aggravating this process is to their previous (and future!) customer s and I decided to let them know exactly what the procedure was, and how it worked. Sent to the only email address I could find, a personal shopper named Cristy. This is her response…. Thank you for contacting us. I’m sorry to hear about this. I have forwarded your feedback over to our IT team so that they can look into this right away. OK, so now I felt just a little bit bad for unloading on such a nice person. Just a little bit. That’s another option, but then, they’re still there …. filling up my allotted storage. 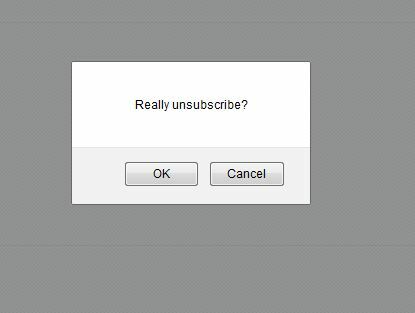 My goal was simply to unsubscribe – how hard should that be? ?